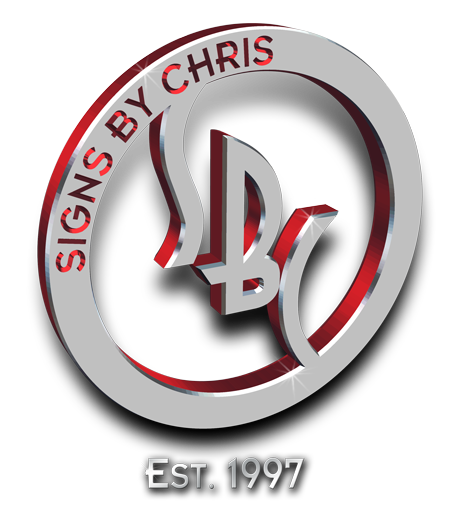 © 2019 Signs By Chris – Tampa, Florida. TERMS: All prices are subject to state and local taxes unless Client is tax exempt and proper tax forms are provided before invoicing. If proper tax forms have not been received by the time of final sale then Client will remain liable for all taxes due. DEPOSIT: Up to a 75% nonrefundable deposit is required before any work will begin. AUTHORIZATION: The Contract consists of any communications between the Client and Seller regarding the project. No work will be done until the Client has agreed to and authorized all details as described in the Contract. It is the Client’s responsibility to understand all specifics regarding the job and to proofread, check and verify any Proof that may be accompanying the Contract. If requested, further specifications will be provided and will become part of the Contract. Communicated authorization or payment of any deposit constitutes agreement to all terms described in the Contract and authorizes work to commence. CHANGES: Due to the individual nature of the products offered, there can be no modifications to any job once the specifications have been authorized. Requests for change, when possible, are at the discretion of the Seller and may require re-quoting. If the Contract has been issued as a revision to a previous Contract it replaces completely and voids all previous Contracts for the items mentioned. If necessary, Seller may modify specifications at his discretion and replace items with items of equal or greater value. RELEASE: Client gives Seller, Seller’s assigns, licensees and legal representatives the irrevocable right to use Client’s name (or any fictitious name), pictures, portraits or photographs in all forms and media and in all, non-defamatory, manners, including composite or distorted representations, for advertising, trade or other lawful purposes and waives Client’s right to inspect or approve the finished product, including written copy, that may be created in connection therewith. WARRANTEE: There is no warranty unless specifically stated in the specifics of this contract. The Seller is not responsible for any mistakes, misspellings, color mismatching, banding, etc. after the Client has authorized the job. Once a job has been authorized and completed, the Client will remain liable for the full amount due. PERFORMANCE: Seller’s performance of the Contract is subject to war, strikes, fires, uncontrollable delays in manufacturer and transit, acts of God, Governmental regulations, or other events of any type that are beyond control of the Seller, thus the Seller shall not be liable for any loss suffered by the Client resulting from any such events. PAYMENT: Payment is due when work is completed. If timely, fair and agreeable access is not granted to Seller to complete the work then payment will become due before final completion. Title to all items shall remain the Seller’s property until payment of the total purchase price has been received. Where payment is made by check, the title shall remain the Seller’s until the checks are finally paid. Upon payment, the Client agrees that all work has been completed and is satisfactory to the Client’s needs and requests as laid out in the Contract. Additionally, the Client shall not commence or maintain any suit thereon against the Seller whether at law or in equity unless specifically stated in the specifics of the Contract. Checks should be made payable to Chris Hart • 110 West Minnehaha Street • Tampa, Florida 33604. CANCELATION: Signs and printed materials are produced for unique, individual use and therefore this Contract is not cancelable and is not subject to countermand. If the Client wishes to cancel a job prior to completion, the Client will remain liable for 100% of the total purchase price, payable upon the date of the cancelation. Any deposit received is nonrefundable and will be applied toward the total amount due. At the time of cancelation, physical materials required for the job may be offered to the Client at the discretion of the Seller. The Seller is not required to surrender any materials to the Client or to hold any materials for any specific period of time. The Seller may keep, reuse or resell the materials, at the Seller’s discretion, at any time, without any form of authorization from the Client. DEFAULT: In the event of a default, interest will be charged, in addition to the amount due, at the rate of 1 ½% per month. Client agrees that, in the event of a default in the terms of the Contract, the Seller has full right to peaceably enter upon the premises, without being guilty of trespass, and may remove said property and the Client agrees to relinquish said property peaceably. In the event that collection or litigation becomes necessary the Client agrees to pay any and all attorney fees, court fees, filing fees, Seller’s time, etc., regardless of outcome, as may be required or necessary for collection of this debt and that any and all litigation may take place in Hillsborough County. If any provision of this contract shall be deemed invalid or unenforceable, the remaining provisions shall remain in full force and effect. ARCHIVING: The Seller has no responsibility to keep, store or retain in any form any of the computer files, artwork, particulars or information pertaining to any job for any Client for any length of time after a job has been completed. It is the Client’s responsibility to request the information and archive, or maintain an archive of the information. In the event of any information being lost for any reason, the Client is responsible for the costs incurred to recreate the lost items. Seller may charge for the media used to store the information.